During your stay, relax and free yourself from daily stress by enjoying well-being spaces at Sunparks De Haan Sunparks and Sunparks Kempese Meren. If you're seeking a healthy, restful vacation you'll enjoy Sunparks' well-being centers, where you can renew your vitality and regain energy. You can now book your spa package at the same time as your accommodations. More care packages are available on site. 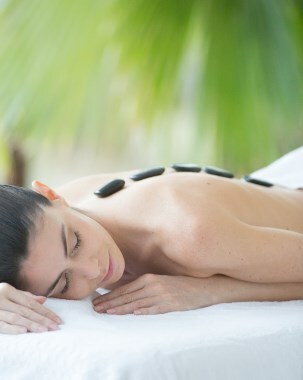 Anti-stress Package €79 at De Haan and €69 at Kempense Meren. Forget the stress of daily pressure and reawaken your own spirit of life. The package includes: 1 seaweed bath, 1 facial scrub, 1 massage with essential oils and access to the sauna and the solarium. Wellness Package €99 at De Hann and Kempense Meren. Let our beauty care experts spoil you. The package includes: 1 facial, 1 algae treatment, a massage with essential oils and a visit to the sauna and solarium. Sauna Pass €56 at De Haan and €44 at Kempese Meren. The Thermal baths pass gives you five entries to the sauna which can also be used by those accompanying you. This way, you benefit from a advantageous reduction compared to the purchase of single entries. ● Holiday villages ideally located a few steps away from the beach. ● Village surrounded by wide forests and located on the lakeside with a beach.